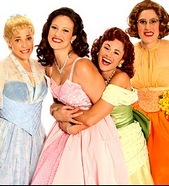 The Marvelous Wonderettes, l-r: Bets Malone (Suzy); Victoria Matlock (Cindy Lou); Beth Malone (Betty Jean); Farah Alvin (Missy). It is altogether likely that playgoers who go to the Westside Theatre to see The Marvelous Wonderettes will soon return with a friend--or two--to enjoy another romp through the pop classics of the 50s and beyond. This confection of a show has already shooped-shooped its way through the Milwaukee Rep in 1999 and Los Angeles stages (see Laura Hitchcock's review), captivating all those who can't resist a catchy tune and a winkingly good story. Consider the story as no more than an excuse to spin out a sweet compendium of songs that can melt anybody within earshot. Roger Bean's long-running hit is essentially a yarn about four singing girls who are having one swell time at their '58 senior prom at Springfield High. Act 2 brings before us the same girl quartet—-but we've fast forwarded to their 10-year reunion. They have gained wisdom and experience amid the grinding traffic of life. It's a simple story but it's that utter simplicity that's the beauty of this show with its sugared array of Eisenhower era songs. So many musicals suffer from elephantiasis with their posh paraphernalia and special effects. But The Wonderful Wonderettes remains wonderfully small , with nothing fancier than a high school gymnasium, gussied up with banners, streamers, and decorations that shine with local color. Set designer Michael Carnahan seems to have given new meaning to the old saw: less is more. The set is anchored by a large platform up center with steps on each side for the 4 young girls to ascend. There are 4 microphones on stands with heart boxes that work in complete service to the musical comedy and romantic themes of the show. The opening numbers conveys a pleasant amateurishness. Missy (Farah Alvin), Betty Jean (Beth Malone), Suzy (Bets Malone), Cindy Lou (Victoria Matlock) toy with 50s songs that we have already pre-digested and know by heart— from the gently demanding "Mr. Sandman," to the slurpingly-good "Lollipop," to the groovy "Son of a Preacher Man." Each song seems to come with its own nostalgic magic. This is an unmistakably American show, with lots of audience participation. The girl quartet is incredibly apt at nudging audience members to join in the fun of prom night. The most conspicuous example comes with the spotlight song "Mr Lee." As the bespectacled Missy delivers her passionate, funny outburst revealing that she's fallen in love with one of the Springfield High teachers, Cindy Lou, Betty Jean and Suzy scour the audience for a flesh-and-blood stand-in. True, the "Mr. Lee" of the moment doesn't have much to do beyond sitting on a stool on stage and listening to his namesake song play out, but the spontaneity of the scene makes it altogether winning. The other sure-fire scene involving the audience is the campaign for the prom queen. Yes, there was a time when women were more likely to campaign for titles like prom queen or Miss Springfield rather than senator or vice-president or president— but one can envision the glass ceiling cracking watching these young girls go, go, go to gain the coveted title of Queen Of Your Dreams. The acting and singing is uniformly excellent. These triple-threats not only have voices that can cut diamonds, but they also give a shot in the arm to the pop standards that defined the 50's and 60's. Director Roger Bean has kept a generous dose of human juice in the musical. He has somehow managed to convey the idealistic dreams of young girls on the brink of womanhood and then succeeds in turning their pipedreams inside-out with scenarios that suggest real life. This lighter-than air jukebox musical offers us much more than charming bric-a-brac. It allows us to be backward time-travelers. No doubt the show is targeted to baby-boomers, to that generation whose youth coincided with a certain prosperity in America. Missy, Betty Jean, Suzy, and Cindy Lou may be more caricatures than characters in this fable but we accept them because, in the final count, they are amusing reminders of our own or our mothers' collective consciousness and past — and because they deliver a real and tasty slice of Americana. Cast: Farah Alvin (Missy), Beth Malone (Betty Jean), Bets Malone (Suzy), Victoria Matlock (Cindy Lou). For more information, please visit www.MarvelousWonderettes.com. Monday, Tuesday, Friday & Saturday at 8pm and Sunday at 7pm, with matinee performances on Wedneday at 3pm and Saturday and Sunday at 3pm. Reviewed by Deirdre Donovan based on September 9th press performance. Songs (Listed in program alphabetically, not credited to singer, as follows: All I Have To Do Is Dream; Allegheny Moon; Born Too Late; Chipmunk Cheer; Dream Lover; Goodnight, Sweetheart, Goodnight; Heatwave; Hold Me, Thrill Me, Kiss Me; I Only Want To Be With You; It's In His Kiss; It's My Party; Leader of the Pack; Lipstick On Your Collar; Lollipop; Lucky Lips; Maybe; Maybe I Know; Mr. Lee; Mr. Sandman; Needle In a Haystack; Rescue Me; Respect; Secret Love; Sincerely; Son of a Preacher Man; Stupid Cupid; Sugartime; Teacher's Pet; Thank You and Goodnight; That's When The Tears Start; Wedding Bell Blues; With This Ring; You Don't Own Me.